Will Justin Fields Or Tate Martell Win The Ohio State Quarterback Job? So, Who Will Be Ohio State's Quarterback Next Season? Ohio State quarterback Dwayne Haskins lit the Big Ten on fire this season, throwing a school- and conference-record 50 touchdown passes while leading an explosive Buckeye offense to a Rose Bowl berth and win. As a redshirt sophomore, he is eligible to declare for the NFL Draft, and the bulk of NFL draftniks project him as the best QB in the class, now that Oregon’s Justin Herbert is going back to Eugene. 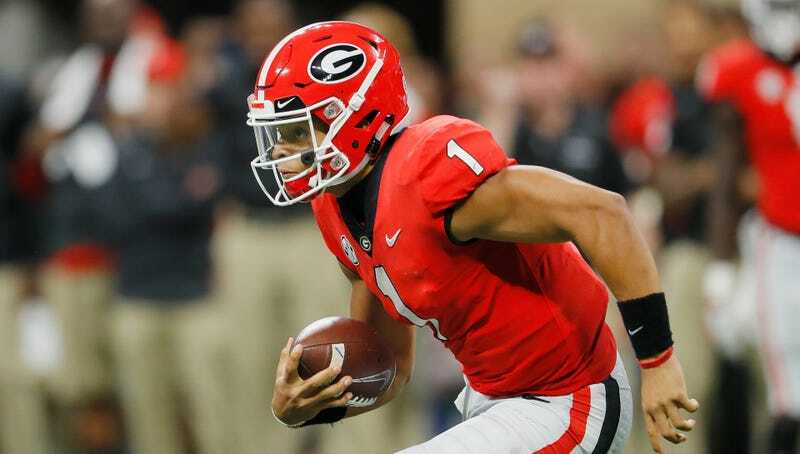 The odds that he will in fact declare for the draft went up today, when several OSU and national outlets reported that coveted Georgia freshman QB Justin Fields is in the process of enrolling in classes at Ohio State and transferring to the Buckeyes. Fields has retained Atlanta lawyer Thomas Mars, who will attempt to get him a hardship waiver from the NCAA that would allow him to be eligible to play immediately. His case is expected to center on when UGA baseball team member Adam Sasser shouted racial slurs at Fields earlier this season, and given Mars’s record of securing hardship waivers, it’s a good bet he’ll be eligible soon. Fields and Haskins are apparently close, and Haskins sent the following cryptic tweet out this morning. To his credit, Martell has been open about the fact that he’ll have to compete for the job no matter what, because even if he’s the most experienced QB the Buckeyes have, he doesn’t have the resume necessary to skip a quarterback competition altogether. I mean, it’s my job to lose really. I can tell you straight up. People like … I mean I have no problem competing against anybody. If Justin wants to come, by all means come. I’m just telling him it’s not as easy as it sounds because, I mean, the offense is just really difficult to pick up. When you transfer, you’re going to play. And, it’s going to be rather difficult. By all means, I’ll be cool. I mean you can come in and do what you got to do. I’m just saying, it’s going to be a lot more difficult than it seems like, just walking in and there’s the job. Whoever starts (probably Fields), bringing in one of the most highly regarded QB prospects in the nation is not a bad way for new coach Ryan Day to make up for the program’s loss of two 2020 recruits.